When you’re going on a trip that lasts longer than a week, you want to pack enough so that you’re not wearing the same thing five times. However, you don’t want to be facing an extra bag charge at the airport, or deal with the fee for going over the 50 pound weight limit for checked bags. The ideal situation is to have a carry on and a personal item, but what options are there if you’re traveling for an extended period of time and have a suitcase that won’t close? These Travel Space Saver Bags could certainly grant you more room in your luggage so long as you’re not going over the weight limit. They’re sized medium to large for packing clothing in a vacuum sealed bag that only needs the air squished out of it without the aid of an actual vacuum. In addition to giving you more room in your bag, you’ll also get protection for your clothes from dust, odors, bugs, and moisture, in case your trip takes you on some wild adventures. This set comes with 8 bags, four being large, which measure 28 x 20”, and four medium, at 24 x 16”. It’s a pretty cheap purchase at only around $18, and will make planning your outfits and keeping them organized a breeze. 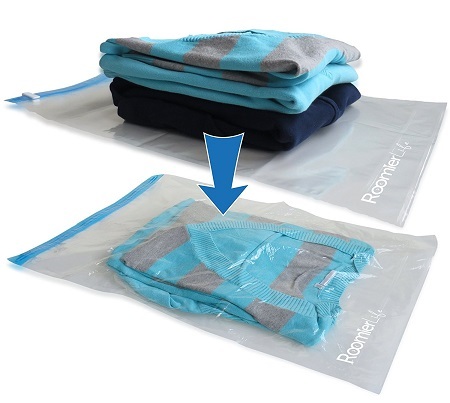 These double-zippered bags are made to be reused indefinitely, and come with sealing clips to make sure they keep the air out no matter what.